Sri Meenakshi Temple is dedicated to the goddess Parvati. Sri Meenakshi Temple, also known as Meenakshi Amman Temple, is a famous and historical cite located just south of the Vaigai River in the 2,500 year old city of Madurai in the Tamil Nadu state of India. This Hindu temple was dedicated primarily to the goddess Parvati and secondarily to her husband Shiva, whom is a Hindu God. The temple is the heart and soul of the 2,500 year old city. Some striking characteristics of the temple are its 14 large gateway towers, which are all between 130 and 170 feet tall, and its two shrines made of gold that depict the gods Shiva and Parvati. To make it an even more enticing, it features more than 30,000 sculptures within its walls! There are five royal courts dedicated to the dancing form of the god Shiva, a hall containing 1,000 hand carved pillars, various halls and sanctums on the temple grounds dedicated to divine worship (some with seemingly endless corridors, and shrines and other amazing architectural work. One of the most interesting temple features is the temple tank and surrounding portico. It's essentially a man-made lake in which no lifeforms are found. Legend has is it that lord Shiva had the lake created to judge literature. Scholars would place their writings on the lake; if they were poorly written they would sink and it they were well written they would float. We know from ancient Tamil literature that Sri Meenakshi Temple was around in ancient India history , but the temple as seen today was built between 1623 and 1655 A.D. It symbolizes the Tamil people, who originated in Tamil, Nadu, India and northern Sri Lanka. The temple pulls in more than 5,000,000 visitors per year, which helps to fund the local economy and creates many jobs in Madurai. Sri Meenakshi Temple is a rarity to the Hindu temples because it's dedicated primarily to Parvati, a goddess. It's partially dedicated to the god Shiva, but only because he was her husband. This makes the temple unique because there are very few female Hindu goddesses and even fewer that have temples dedicated to them. Tamil Nadu, India is located in southern India, where most temples are dedicated to Shiva. Legend tells the tale that king Malayadwaja Pandya and his wife Kanchananalaj prayed for a child around holy fire and that an infant version of Parvati appeared. This infant was born with three breasts, but a voice from the heavens told her new parents not to worry because one of her breasts would disappear when she met her true love. The infant was named Tadaatagai and when she grew up, she was crowned. She waged war on different mystic worlds. She conquered Sathyaloka (Brahma's world) Vaikunta (Vishnu's abode) and Amaravaiti (the world of the Devas). When she attempted to conquer Shiva, she could not fight him due to her shyness and. her third breast vanished when she instantly knew would marry Shiva. Shiva and Tadaatagai returned to Sri Meenakshi Temple where they were married and from where they ruled together. Sri Meenakshi Temple is an amazing place to visit, its staff is well organized and there is fantastic shopping inside and outside of the temples. Every evening before the closing of the temple a procession of drummers and other musicians carry the image of both Meenakshi and Sundareswarar to Meenakshi's bedroom to symbolize how they consummated their union. Several exciting festivals happen around the temple each year. The most important happens each April and is called Meenakshi Thirukalyanam (The divine marriage of Meenakshi festival). The marriage of Parvati and Shiva is considered a classic example of south Indian female-dominated marriage, or Madurai marriage. The marriage brings together all people and deities and mortals in order to celebrate Meenakshi as the royal monarch. During April, a number of events including the Ther Thiruvizhah (chariot festival) and Theppa Thiruvizhah (float festival) also occur. Major Hindu festivals are celebrated inside the temple. 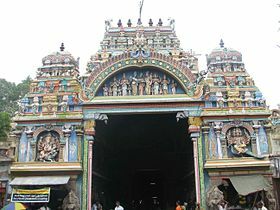 Like most Shakti temples in Tamil Nadu, the Fridays during the Tamil months of Aadi (July–August) and Thai (January - February) are celebrated in the temple by thousands of devotees. Leave Sri Meenakshi Temple to visit other India tourism destinations.